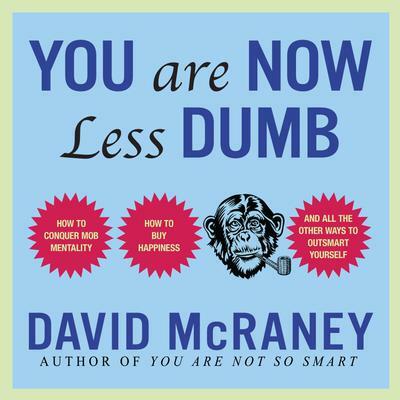 The author of the bestselling You Are Not So Smart shares more discoveries about self-delusion and irrational thinking, and gives listeners a fighting chance at outsmarting their not-so-smart brains David McRaney’s first audiobook, You Are Not So Smart, evolved from his wildly popular blog of the same name. A mix of popular psychology and trivia, McRaney’s insights have struck a chord with thousands, and his blog—and now podcasts and videos—have become an Internet phenomenon. Like You Are Not So Smart, You Are Now Less Dumb is grounded in the idea that we all believe ourselves to be objective observers of reality—except we’re not. But that’s okay, because our delusions keep us sane. Expanding on this premise, McRaney provides eye-opening analyses of fifteen more ways we fool ourselves every day, including: • The Misattribution of Arousal (Environmental factors have a greater affect on our emotional arousal than the person right in front of us) • Sunk Cost Fallacy (We will engage in something we don’t enjoy just to make the time or money already invested “worth it”) • Deindividuation (Despite our best intentions, we practically disappear when subsumed by a mob mentality) McRaney also reveals the true price of happiness, why Benjamin Franklin was such a badass, and how to avoid falling for our own lies. This smart and highly entertaining audiobook will be wowing listeners for years to come.